Playing Trinity on their home deck is one of the toughest challenges in A grade football. They have played in the past two Grand Finals and have established themselves as the best kicking side over the past few years. Despite this, we were chock full of momentum after a significant victory against Collegians. We were strengthened by the inclusions of Jason Tutt, David Lowe and our Collingwood listed debutant Michael ‘Chip’ Chippendale. Chip was named in the recent VFL state squad and his addition to our side was timely. Trinity’s oval is the largest in the VAFA, equal to the MCG. We were looking forward to the opportunity for improved ball movement in vast open space and perfect conditions. Having said all that, we didn’t start well. Trinity kicked 3.1 in the first term from limited inside 50 entries to our 1.5 with some really poor misses directly in front of goal. In the second we saw signs of better ball movement and again leading the inside 50 count, only to register 2.4 with some more costly misses. Fortunately our defence was again standing tall with Brendan Close, Chris Robinson, Sam Haslem & Chippendale all providing plenty of rebound. Skipper Tom Humphrey and his reliable sidekick David Convery were winning their 1v1 contests against quality opponents. We only conceded 0.3 for the term and took a lead of just 5 points at the main break. At half time we made some forced changes with midfielder Jake Gotch out for the rest of the game and a very sore Jake Williams compromised by a big hit early in the game. Jake was moved deep forward and Sam Williams went into the midfield. The two brothers adapted to the moves, with Jake in particular making a big difference as the game progressed. The Walker twins Andrew and Lachy were sensational in the midfield, igniting our team with Andrew kicking a terrific running goal in the third quarter. Our ruckmen Cullinan & Forato were starting to take control of the stoppages and Tutt on the wing was instrumental in getting our running game going. 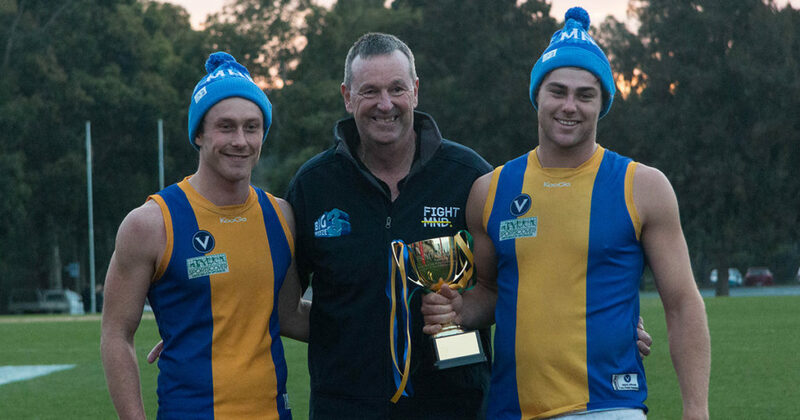 Matt Fieldsend was winning plenty of the ball and Ben Nethersole was playing his best footy for the season. Trinity came at us late in the third, kicking 2.5 to our 3.2 and we held a leadof eight points. Both sides were lamenting their poor ball use – ineffective disposals and turnovers dominated the game. We spoke about playing direct football and taking more care with our disposal and in the last the lads really cliced. We played one of our best quarters for the season, kicking 6.2 to 1.1. All our forwards were given ample opportunities to compete 1v1 as a result of our quick ball movement with Indovino, Pickett and Jake Williams all lively and hitting the scoreboard. Once again we had many solid contributors led by Robinson, Close, Tutt, Chippendale, Nethersole, Fieldsend and the Walker brothers. Jake Williams kicked three goals, Sam Pickett had one of his best games kicking two and Indovino continued his strong season with another two goals. It was a convincing win in the end which puts us into the top four with a timely bye next week. We headed out to the spacious grounds of Trinity College in perfect conditions for a game we considered to be very winnable. Again we were running out a very young side, but the inclusions of a couple of senior players gave us a lift in confidence. We were also celebrating Luke Williams and Simon Lowe on playing their 150th games for the club, a great effort. It was a scrappy start to the game by both teams. At quarter time we trailed by two goals but in the second we once again had a ten min lapse in concentration that allowed Trinity to kick six goals to two. At half time we were down by six goals. We still believed we were in the game, despite the deficit. After half time we urged the boys to continue our game style and as we have said before, our method is fine – the execution is where we are letting ourselves down. We will continue to work on this. After half time we matched Trinity on the scoreboard but we just need to tidy up our use of the ball. Some of our better players were Michael Griechen, who played his best game for the year. Mason Martinez continues to impress down back and David and Simon Marchese were very good. It was also great to see Josh Tyquin get a game under his belt, he was a good contributor. Callum Dooley kicked another two goals and was involved in most of our forward entries. Simon Lowe also kicked two. So we are still looking for our next win, which is not far away. Over the coming bye weekend we’ll recharge the batteries and get ready to have a real crack in two weeks. We must keep working hard. Fortunate to be playing on yet another perfect day for footy, we were looking forward to a fantastic contest against the reigning premiers St Kevin’s. The boys were challenged during the week to embrace the contest, meet it head on and play the game on our terms. The contest was fierce early. Our pressure around the ball was excellent and we knew it was going to be a tough battle. The first half was fairly even. Inaccurate kicking for both teams was making it a low scoring affair. We didn’t help ourselves with our ball use inside 50, shallow entries were hurting us and the boys were being fairly predictable going forward. We addressed this at half time. We wanted to make a statement in the second half. To our credit, that’s exactly what we did. St Kevin’s came at us hard. They stepped up there physicality in a bid to throw us off our game. Our boys responded in fantastic fashion. Led by Shannon and Pennell, our attack on the ball was excellent. We sharpened up our ball movement and got it into our forwards quickly, who were able to have scoreboard impact. Best players were Shannon, Pennell, Deftereos, Ahearn, O’Sullivan and O’Callaghan. Overall, another pleasing result. There’s still many things to work on. The break has come at an ideal time because we’ve got plenty of sore bodies crying out for a rest. We’ll enjoy our week off and come back ready to learn, improve and get better. A much changed and somewhat depleted Golds took on SKOBS and despite the best efforts of the team were overrun by a much more disciplined and better drilled opponent. The Golds were upset by a number of changes leading up to the game and on match day too – a bout of flu was running through the team which made the task much, much harder on a day when the team were going to be tested. Overall, the efforts of the team were spasmodic. Interspersing the highlights of some terrific team work was some slapdash and lackadaisical efforts which only served to demonstrate the difference between the teams. One team worked harder for longer, the other not so long or so determinedly. To the players who dragged themselves off their sick bed to help us out it was much appreciated, and despite their best efforts it only served to highlight the size of the task ahead of us on the day. To make matters worse, we look to have lost yet another player to a long term injury, another unwanted dose of bad medicine. It is important to note those who did play well across the entire game. A terrific game from Tom Christiansen as an undersized ruck gave us a wholehearted effort. He was helped by our defence led by Dan Brasher, Cooper Morris and Jimmy Mullaly, Nathan Antonucci, Danny Melissinos and Mitch Riley were good in our mids. However, we just had too few offering too little for too long and as such we were well defeated by a much better team on the day. We head to break looking to regain a few players, but also to reset some team and individual goals as we look to make a concerted push to finals. This week we were playing the bottom team and it was going to test the group and how they approach a winnable game. After 20 mins of footy the scoreboard was untouched, so much expectation with so little result. Brunswick had a few handy players and we sorted ourselves out at quarter time. IN the second, we kicked 4.3 to zip. The girls played run and carry footy and the ball lived inside our 50 for the majority of the quarter. Big V selection Carle’ Rooks kicked two and Bec Fietz and Casey Sykes got one each, Sally Fyfield was as hard as ever hitting every contest with pace and breaking the lines and Jess Weltner marking everything across half back. Unfortunately Hannah Wittaker came off with a broken collar bone so her season is over – please make sure you give her your support when you see her. In the second half we scored three more points and kept Brunswick scoreless. Although we had plenty of opportunities to score, we need to keep practicing our running shots on goal. The scoreboard pressure all day was a result of our hardworking midfield and quick kicking from stoppages. We swung a few players around in the last and gave a few girls a chance to play forward. Our best players were Jess Weltner, Sally Fyfield, Abbey Snell, Steph McMurray and Mary Luong. The only other item to tidy up is the song after the game- there were smiles all round with lots of lip syncing – hopefully we get to sing it loud again soon! Looking forward to the bye and giving the group a chance to rest. The colts took on an improving Aquinas at home who had won three of their previous four games. The boys were keen to put the last quarter of the previous week behind them and to begin with a fierce attack on ball and opponent. Despite starting well, we did not bring this fierceness or show a desire to be strong over the ball and at times allowed Aquinas to dominate us physically in the first half. The first half was bereft of many highlights and the game was in the balance when we headed to the sheds holding a slender one goal lead. The second half was a lot better. Joe Squires showed the way with five early tackles, together with a desire to win the ball at any costs and our forwards were working harder to take advantage of the opportunities presented. We need to be less predictable, especially when opponents play extras behind the ball. We need to spread more, use the space and take the game on. This is a common theme in a lot of our games and an area we need to work on and persist with. Ky Morgenthaler led the way off half back, Cam Roberts continues to rack up possessions across the wing. Tom Vance provided a target, kicked three and gave away a couple more, Ollie Gunning showed class across half forward and Joe Squires showed us how to attack the footy. The Warriors had an early fixture with a 9:20am match against Scotch, who also came into the game sitting at 6 wins and 1 loss with a healthy percentage. The first quarter saw De La control the tempo of the game with the ball largely in our attacking half. We had ample opportunities to hit the scoreboard though inaccuracy would later come back to cost us. The quarter ended with us leading by only four points, with four more scoring shots. We had been winning the stoppages comfortably in the first quarter though as the second term progressed we became reactionary and chasing the ball. Letting five goals through and only scoring two ourselves meant that we went into the main break with the momentum against us and some work to do. The third started as an arm wrestle and there was plenty of feeling in the match, though letting our guard down towards the end of the term and not being able to hit the scoreboard during the quarter meant we had left ourselves a bit too much to do in the last. We kicked the first three goals of the final term and were in a poition to run over the top of Scotch, though they held strong and finished with the last few goals of the game to run out comfortable winners. Lachie Bull and Josh Oakley shone in the midfield and on the wings, with Mark Breda and Tom Kovarik working well swapping between ruck to full forward. Beau Hill and Joel Stewart were solid in defence where they were tested regularly. The Dino’s continued to roll as we recorded a tough six goal victory. After a tight and competitive first half the Dino’s upped our intensity in the second half to run away with a solid win. Frankly, there were many standout performances from a number of players and it would be unfair to single out only a few when the total team effort was clearly the overwhelming factor in the result. The only down side to the game was a potential serious shoulder injury to Matt Durack who has been a vital part of the team. The team was clearly uplifted by the presence of the Founding Father, The General, who was present on the sideline. Having The General marching along the field of play is the closest anyone might come to replicating the era of when Vince Lombardi stood on the sideline for the Green Bay Packers. The confidence and expectation of The General’s presence is something only other teams can envy. The Dino’s show goes back to the Dairy Dome in two weeks when we will face off against Craigieburn. We encourage all supporters of the club and team to attend, admission is free and certainly the football is watchable.